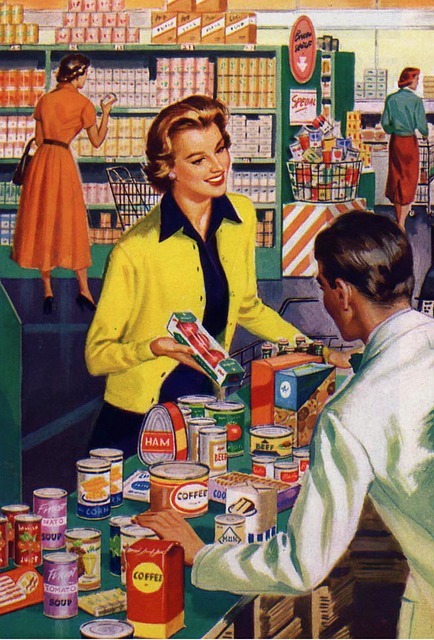 The grocery shopping days of yesteryear/the beginning of the end. I was home with my mum this past weekend and she asked me for some tips on how to navigate the jungle of the grocery story. In this day and age the grocery store is wonderful in that it has a plethora of options for you to choose from, HOWEVER, those options can become overwhelming in a hot second. I mean the simple task of buying eggs let’s say…can turn into a nightmare…there are endless options! Medium, large, extra-large …cage free, free-range, pasture-raised, natural, grass-fed, organic, omega 3 boosted. Ahh so overwhelming! No wonder there are moments in the aisle where you might be holding 2/3/4 items trying to figure out…what on earth is the difference…and what is the healthier option? Not to mention the worry over price, quality, and tasting good. Argh. Well, don’t fret! I wanted to give my mum at least a few pointers that might steer her in the right direction so she could opt for the healthier options when shopping, and have some peace of mind about the food choices she was making. First look at the ingredient list on the packet. It should contain real foods, foods you can pronounce, and the few ingredients the better. The list of ingredients is in order of the amount of that food that is in the product i.e. tomato sauce the first ingredient should be tomatoes as that should be what it is mostly made of, and you don’t want too many more ingredients in your tomato sauce other than a few spices and that’s all. The fruit and vegetable area only has one ingredient in it, the fruit and veggie itself! Easy options to choose! Second, buy organic. There are several labels/terms used by manufacturers now that are CONFUSING ‘natural’, ‘no GMO’, ‘Gluten Free’, ‘Grass Fed,’ ‘Fair Trade,’ ‘no antibiotics,’ ‘all natural’… A lot of terms used by manufacturers have no regulation so it is essentially meaningless i.e. ‘natural.’ By and large the simplest rule of thumb is to opt for ‘USDA approved Organic’, and if possible grass fed meat. “USDA 100% organic” guarantees that the product is comprised of 95% or higher organic ingredients, it is non-GMO, it is produced without using harmful or toxic pesticides, does not use petrol fertilizer, no ionizing radiation/bio engineering is used, and no growth hormones or antibiotics are used. Now I know that buying organic everything can be pricy, so I recommended that if you have to make a trade off, prioritize buying organic for your meat, fish, dairy, fruit and veg. There was a recent Stanford study refuting the need to buy organic, however, this scientific study only compared the nutritional value (i.e. calories of macronutrients such as fat, carbohydrates and proteins and vitamin levels) of organic food to commercially produced foods. However, the study did not account for the risks associated with eating non-organic/commercially produced food in terms of the pesticides, organophosphates, and other farming chemicals that you’re exposed to that effect your endocrine system, liver, and hormonal balance. DAIRY: Some foods naturally have sugar in them like dairy (the lactose in milk has naturally occurring sugar), however, in this day and age food companies tend to add a little more sugar, however in products than they need like bread or tomato sauce. Carefully look at the ingredient list on these items and make sure ‘sugar’ isn’t listed on the ingredient too close to the top of the list. BREAD/CEREALS: A little bit of sugar in bread is natural for the bread to rise (i.e. 2-3g) but any more than that is unnecessary. The same goes with cereals which is a monster when it comes to sugar levels. Look at the ingredient list and if sugar is the 2nd or 3rd ingredient, I would recommend steering clear. A lot of kid’s cereals in particular have heaps of sugar in them. I used to love Frosted Flakes (10g/serving) and Sugar Puffs (15g/serving), but then I realized how much sugar was in them and was grossed out! In the case of Sugar Puffs (the UK version of Honey Smacks) the 2nd, 3rd, 4th, and 5th ingredient are all different types of sugar! They were more of a dessert than a great way to start a day for breakfast, man ow man. In contrast oats has 0g of sugar and is a great option. You can always add sugar yourself, because in this respect you at least know how much you’re adding and can control the amount of sugar yourself. SWEET TREATS/GRANOLA BARS: The key foods that you need to watch for with sugar are sweets, treats, cupcakes, granola bars. I am a die-hard sweet tooth so I am the first one to hit the sweets aisle, but just be mindful that a lot of granola bars masquerade as ‘healthy’ but are in fact loaded with sugar. Try and keep this number low’ish and make sure to catch if sugar is the first or second ingredient in the list. Fat is the most caloric dense nutrient AKA a tablespoon of olive oil has 120 calories but a tablespoon of oats only has 25 calories. (For every 1g of fat in a food there are 9 calories vs for every 1g of carbohydrates/protein there are 4 calories) Nutty! So try and choose products with reasonable amount of fat, and try and opt for unsaturated fat when possible i.e. nuts, seeds, avocadoes, fish, olive oil etc. This is the most fun guideline! Because you get to be adventurous in the grocery store! Try out foods that you might not have eaten before. Add one item to your list each week that you’ve had at a restaurant, you’ve read about, or a friend has recommended. There are lots of ‘how tos’ online to help you in regards to preparing different foods. A good rule of thumb is eating the rainbow. The more colour on your plate the better, as this is normally a sign of a rich variety of vitamins and minerals in your food. A good place to start is the vegetable and fruit section where there are bountiful options of produce that you might not have ever had before i.e. have you ever tried Portobello mushrooms instead of a burger? These mushrooms have a steaky flavor to them believe it or not and are a great substitute for meat once in awhile. Or perhaps bok choy an awesome veggie to add to a stir fry that is packed with nutrients ~ high in antioxidants, great at fighting inflammation, great for bone, skin, and hair health! Don’t fret too much. There is no point beating yourself up standing in the aisle for 10+ minutes trying to figure out which is the best chocolate bar or box of eggs for you, family, and friends. Pick the option you think might be the best one, and know that you are doing your best. Each and every time you try and pick a better option, you are learning. And if you’re curious, want to learn more, you can look up the food on google and learn about its quality. You can go on the company’s website, which is invariably listed on the packet, and read about how they make their foods. You can also look up the ingredients from the ingredients list of the packet to learn what each of their health benefits are. EWG.org is a non-profit org that provides a helpful database that ranks foods based on their nutrition, ingredients, and processing. They also have a helpful little pros and cons list for each food in the database. Their database has over 80,000 foods, so although not everything will be in there, it has a good amount. They also have helpful guides for buying healthy foods on a budget etc. I hope this helps solve a few grocery aisle dilemmas and happy shopping! If you need help taking the first step, I offer grocery store tours as part of my health coaching services. In addition, do not hesitate to reach out to me if you have any questions on this article, or about living a healthier happier lifestyle.